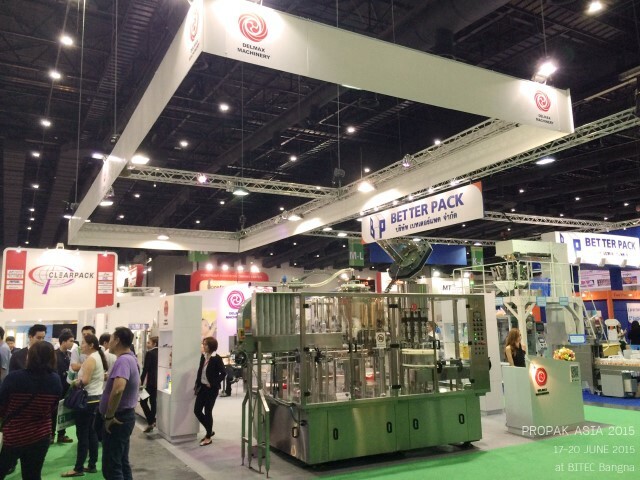 ProPak Asia 2015, 17 - 20 JUNE 2015, BITEC, BANGKOK, THAILAND. DELMAX MACHINERY to participate in PROPAK ASIA 2015 17-20 June 2015 at BITEC Bangna,Bangkok. DELMAX MACHINERY has brought developed machine and new design to exhibit on PROPAK ASIA 2015. And exhibitors a lot of attention. DELMAX MACHINERY Co.,Ltd. Address : 156/46 Soi.Wattananun Viphavadhi-Rangsit Rd. Sigan Donmuang Bangkok 10210 Thailand TEL : 662-929-4621 FAX : 662-565-3240 Email : sales@delmax.com Copyright 2014 © by Delmax Machinery Co.,Ltd.